Floridians Stand Together To Show We Are Complacent No Longer! Florida is Uniting for America! August 22, 2009 6pm-8pm Comment Here! The Lake Eola Amphitheater at 195 N. Rosalind Av, Orlando For Direction, Map and Parking info Click HERE. NOTE: Most parking is metered. What: On March 21, 2009 the state of Florida united as one voice and was heard all the way to Washington. Since then, Florida has been a leader in the movement to restore Conservative Values to America. There have been numerous Tea Parties throughout the state in the past six months and the overwhelming participation shows that the people of the Sunshine State are dedicated to taking their country back! 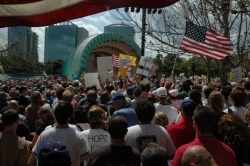 On August 22, 2009, Floridians Unite will hold another event at beautiful Lake Eola to celebrate our patriotism, unite as a voice of conservatism and also to inspire, facilitate and educate fellow Floridians about current issues and what each of us can do to stop the ebb of socialism threatening our nation. We will also have a variety of booths which will offer you the information, the resources, the motivation and the confidence to become active and make a difference! This is a TRUE grassroots event, we are everyday people like you, trying to make this event a reality. The March 21st event cost $5000 and the people of Florida made it happen with $5, $10 and $20 donations. We need your help us once again, please take a moment to click the donate button and know that you made the Uniting for America event happen. We are also offering sponsorships and vendor booths, please contact floridiansunite@gmail.com for more info! Sponsor a Booth: Contact us at floridiansunite@gmail.com to learn more about how your company can sponsor this event and be provided a booth.